Abraham Lake was created in 1972, with the construction of the Bighorn Dam. The Government of Alberta sponsored a contest to name the lake in February 1972, during the final stages of construction of the Bighorn dam. Students across the province were asked to submit names taking into consideration “historical significance, prominent persons, geography and topography, and the value of the lake.” It was named for Silas Abraham, an inhabitant of the Saskatchewan River valley in the nineteenth century. Although man-made, the lake has the blue color of other glacial lakes in the Rocky Mountains, which is caused by rock flour as in other glacial lakes. The vivid colors in the spring are the result of pigmented archaea in the microbial mats that grow around the edges of the mineral-rich water. The archaea produce colors ranging from green to red; the amount of color in the microbial mats depends on the ratio of chlorophyll to carotenoids and on the temperature of the water which favors one archaea over another. In the summer, the mats tend to be orange and red, whereas in the winter the mats are usually dark green. The center of the pool is sterile due to extreme heat. “Grand Prismatic Spring” by David Mencin, distributed by the EGU under a Creative Commons licence. The Wave is a sandstone rock formation located in the United States of America near the Arizona–Utah border, on the slopes of the Coyote Buttes, in the Paria Canyon-Vermilion Cliffs Wilderness, on the Colorado Plateau. It is famous among hikers and photographers for its colorful, undulating forms, and the rugged, trackless hike required to reach it. There is a lottery for next day permits (ten permits) in person or on line (ten permits) several months before. If you win the agency will supply you with map and information. “The Wave” consists of intersecting U-shaped troughs that have been eroded into Navajo Sandstone of Jurassic age. The two major troughs, which comprise this rock formation, are 62 feet (19 m) wide by 118 feet (36 m) long and 7 feet (2 m) wide by 52 feet (16 m) long. Initially, infrequent runoff eroded these troughs along joints within the Navajo Sandstone. After their formation, the drainage basin, which fed rainwater to these troughs, shrank to the point that the runoff became insufficient to contribute to the cutting of these troughs. As a result, the troughs are now almost exclusively eroded by wind, as indicated by the orientation of erosional steps and risers cut into the sandstone along their steep walls. These erosional steps and risers are oriented relative to the predominant direction of the wind as it is now naturally funneled into and through these troughs. Salar de Uyuni (or Salar de Tunupa) is the world’s largest salt flat at 10,582 square kilometers (4,086 sq mi). It is located in the Daniel Campos Province in Potosí in southwest Bolivia, near the crest of the Andes and is at an elevation of 3,656 meters (11,995 ft) above mean sea level. The Danxia landform (Chinese: 丹霞地貌; pinyin: dānxiá dìmào) refers to various landscapes found in southeast, southwest and northwest China that “consist of a red bed characterized by steep cliffs”. It is a unique type of petrographic geomorphology found in China. Danxia landform is formed from red-coloured sandstones and conglomerates of largely Cretaceous age. The landforms look very much like karst topography that forms in areas underlain by limestones, but since the rocks that form danxia are sandstones and conglomerates, they have been called “pseudo-karst” landforms. 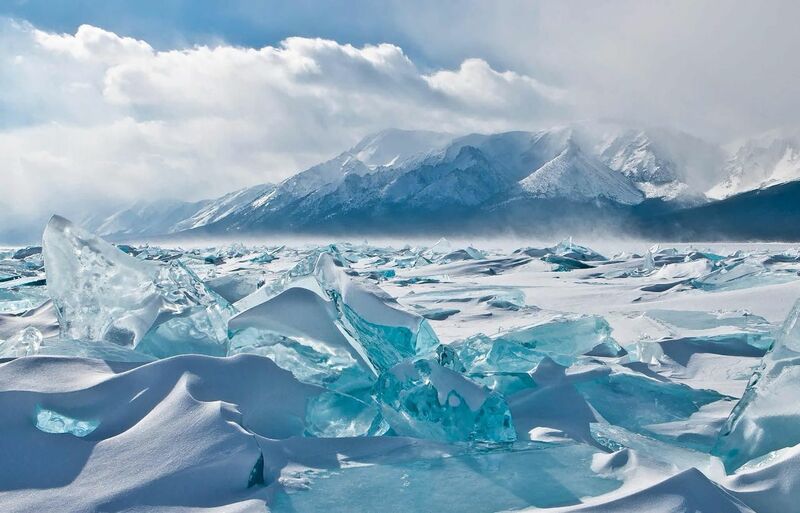 Lake Baikal is the largest (by volume) freshwater lake in the world, containing roughly 20% of the world’s unfrozen surface fresh water. With a maximum depth of 1,642 m (5,387 ft), Baikal is the world’s deepest lake. It is considered among the world’s clearest lakes and is considered the world’s oldest lake — at 25 million years. It is the seventh-largest lake in the world by surface area. With 23,615.39 km3 (5,700 cu mi) of fresh water, it contains more water than all the North American Great Lakes combined. The Richat Structure, also known as the Eye of the Sahara and Guelb er Richat, is a prominent circular feature in the Sahara desert near Ouadane, west–central Mauritania. This structure is a deeply eroded, slightly elliptical, 40 km in diameter dome. The sedimentary rock exposed in this dome ranges in age from Late Proterozoic within the center of the dome to Ordovician sandstone around its edges. The sedimentary rocks comprising this structure dip outward at 10°–20°. Differential erosion of resistant layers of quartzite has created high-relief circular cuestas. Its center consists of a siliceous breccia covering an area that is at least 30 km in diameter. The Tunnel of Love is an amusement railway located near Klevan, Ukraine. It is a railway surrounded by green arches and is three kilometers in length. It is known for being a favorite place for couples to take walks. Chand Baori is a stepwell situated in the village of Abhaneri near Jaipur in the Indian state of Rajasthan.Chand Baori is one of the oldest and most attractive landmarks in Rajasthan. It was built by King Chanda of the Nikumbha Dynasty between 800 and 900 AD and was dedicated to Hashat Mata, Goddess of Joy and Happiness upon completion. The state of Rajasthan is extremely arid, and the design and final structure of Chand Baori was intended to conserve as much water as possible. At the bottom of the well, the air remains 5-6 degrees cooler than at the surface, and Chand Baori was used as a community gathering place for locals during periods of intense heat. One side of the well has a pavilion and resting room for the royals. Lake Retba or Lac Rose (meaning Pink Lake) lies north of the Cap Vert peninsula of Senegal, some 30 km (18 miles) north-east of the capital, Dakar in northwest Africa. It is named for its pink waters caused by Dunaliella salina algae and is known for its high salt content, up to 40% in some areas. The lake is separated from the Atlantic Ocean only by a narrow corridor of dunes, and is named for its pink waters, caused by Dunaliella salina algae. The algae produces a red pigment to assist in absorbing light, which provides energy to create ATP. The color is particularly visible during the dry season (from November to June) and is less visible during the rainy season (July to October). Magenta coloured samphire bushes flourish in the white sandbanks, and the sand dunes are terra-cotta-coloured. Socotra (Arabic: سُقُطْرَى‎ Suquṭra), also spelled Soqotra, is an island and a small archipelago of four islands in the Indian Ocean. Socotra is part of Yemen. It had long been a part of the Aden Governorate. In 2004 it became attached to the Hadhramaut Governorate, which is much closer to the island than Aden (although the nearest governorate was the Al Mahrah Governorate). In 2013, the archipelago became its own governorate. The island of Socotra is about 95% of the landmass of the archipelago. It lies some 240 kilometres (150 mi) east of the Horn of Africa and 380 kilometres (240 mi) south of the Arabian Peninsula. The island is very isolated and a third of its plant life is found nowhere else on the planet. It has been described as “the most alien-looking place on Earth”. The island measures 132 kilometres (82 mi) in length and 49.7 kilometres (30.9 mi) in width. The Door to Hell (also known as the Gates to Hell, the Crater of Fire, Darvaza Crater) is a natural gas field in Derweze, Turkmenistan, that collapsed into an underground cavern in 1971, becoming a natural gas crater. Geologists set it on fire to prevent the spread of deadly methane gas, and it has been burning continuously since then. The diameter of the crater is 69 m, and its depth is 30 m.
The site was identified by Soviet engineers in 1971. It was originally thought to be a substantial oil field site. The engineers set up a drilling rig and camp nearby, and started drilling operations to assess the quantity of oil available at the site. When they instead found gas, the ground beneath the drilling rig and camp collapsed into a wide crater and disappeared. Expecting dangerous releases of poisonous gases from the cavern into nearby towns, the engineers thought it best to burn the gas off. It was estimated that the gas would burn out within a few weeks, but it has instead continued to burn for more than four decades. Caño Cristales (English: Crystal Spout) is a Colombian river located in the Serrania de la Macarena province of Meta. It’s a tributary of the Guayabero River. The river is commonly called the “River of Five Colors” or the “Liquid Rainbow”, and is even referred to as the most beautiful river in the world due to its striking colors. The bed of river in the end of July through November is variously colored yellow, green, blue, black, and especially red, the last caused by the Macarenia clavigera (Podostemaceae) on the bottom of the river. Red Beach, located in Dawa County, Panjin,Liaoning, China, is famous for its landscape featuring the red plant of Suaeda salsa of the Chenopodiaceae family. It is based in the biggest wetland and reed marsh in the world. The landscape is composed of shallow seas and tide-lands. The Sueda is one of the few species of grass that can live in highly alkaline soil. Its growth cycle starts in April when it is coloured light red, while the colour of the mature species is deep red. Angel Falls is the world’s highest uninterrupted waterfall, with a height of 979 metres (3,212 ft) and a plunge of 807 metres (2,648 ft). The waterfall drops over the edge of the Auyantepui mountain in the Canaima National Park (, a UNESCO World Heritage site in the Gran Sabana region of Bolívar State. The height figure 979 metres (3,212 ft) mostly consists of the main plunge but also includes about 400 metres (0.25 mi) of sloped cascades and rapids below the drop and a 30-metre (98 ft) high plunge downstream of the talus rapids. Mendenhall Glacier is a glacier about 13.6 miles long located in Mendenhall Valley, about 12 miles (19 km) from downtown Juneau in the southeast area of the U.S. state of Alaska. The glacier and surrounding landscape is protected as the 5,815-acre Mendenhall Glacier Recreation Area, a federally designated unit of the Tongass National Forest. The Juneau Icefield Research Program has monitored the outlet glaciers of the Juneau Icefield since 1942, including Mendenhall Glacier. The glacier has also retreated 1.75 miles (2.82 km) since 1958, when Mendenhall Lake was created, and over 2.5 miles (4.0 km) since 1500. The end of the glacier currently has a negative glacier mass balance and will continue to retreat in the foreseeable future. Lake Hillier is about 600 metres (2,000 ft) in length by about 250 metres (820 ft) in width. The lake is surrounded by a rim of sand and a dense woodland of paperbark and eucalyptus trees with a narrow strip of sand dunes covered by vegetation separating its northern edge from the northern coast of Middle Island. The most notable feature of the lake is its pink colour. The vibrant colour is permanent, and does not alter when the water is taken in a container. The source of the pink colour is considered to be due to the presence of the organism Dunaliella salina. Air is the best mode of transportation for viewing the lake. Jade Dragon Snow Mountain is a mountain massif (also identified as a small mountain range) near Lijiang, in Yunnan province, southwestern China. The range is also known as Mount Yulong after the Chinese or Mount Satseto after the Naxi name. Its highest peak is named Shanzidou (5,596 m or 18,360 ft). What amazing images and definitely inspirational – I’ve been to a couple ( – but you have given me so many to add to my (ever growing) bucket list. Yemen and Yulong Mountain just look incredible. Thank you for sharing! 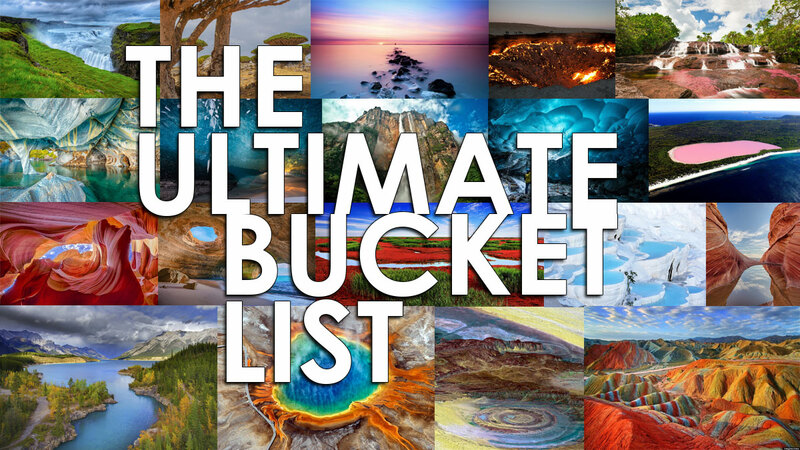 Gorgeous images Nina and so many destinations I’d love to visit! Hi Sabina! Thanks a lot for stopping by! I have the banner in the sidebar from the very first minute. It’s a pleasure to be a part of this group and communicate with all of the amazing ladies here! Such beautiful images! Especially Grand Prismatic Spring, also so many places I hadn’t heard of before so Thank you!